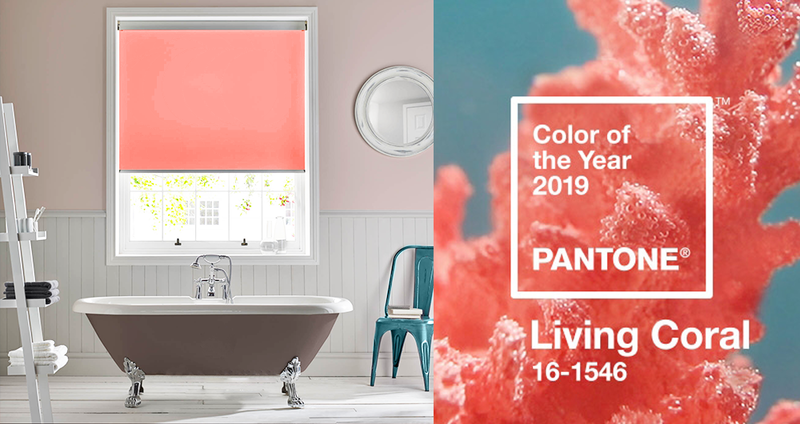 It’s always an exciting time for us at Express when Pantone announce their colour of the year and this year it’s PANTONE 16-1546 Living Coral. 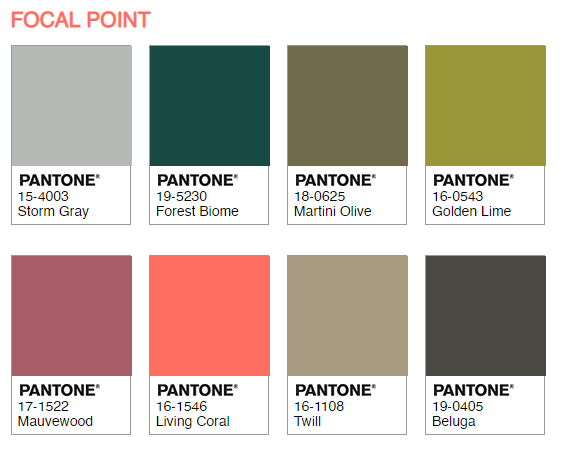 We love the choice and in particular the different colour palettes Pantone have selected to work with the main colour. We are going to discuss our favourite elements of the colour palettes and how you can get them to work in your home. 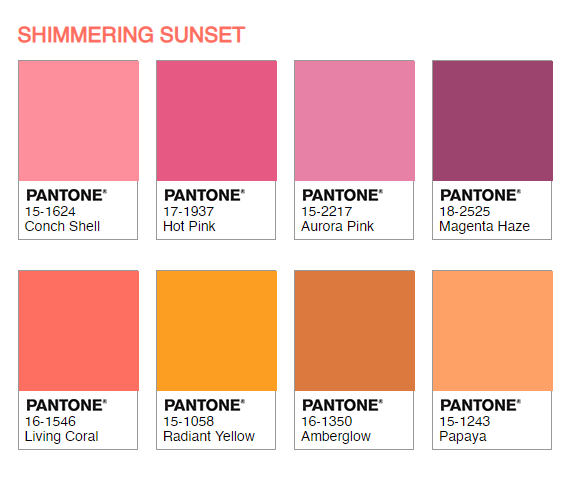 But first, here’s what Pantone said about the colour they chose. ‘In reaction to the onslaught of digital technology and social media increasingly embedding into daily life, we are seeking authentic and immersive experiences that enable connection and intimacy. Sociable and spirited, the engaging nature of PANTONE 16-1546 Living Coral welcomes and encourages light hearted activity. Symbolizing our innate need for optimism and joyful pursuits, Pantone 16-1546 Living Coral embodies our desire for playful expression. Focal Point – The natural greens and neutral greys of this colour palette really set off the Living Coral hue making it the perfect focal point of any room. The soothing greens would make this a perfect colour for a living room as it can taking on a warming tone when mixed with the right textures, woollen rugs, natural woods and plants a plenty will keep that cosy feeling. 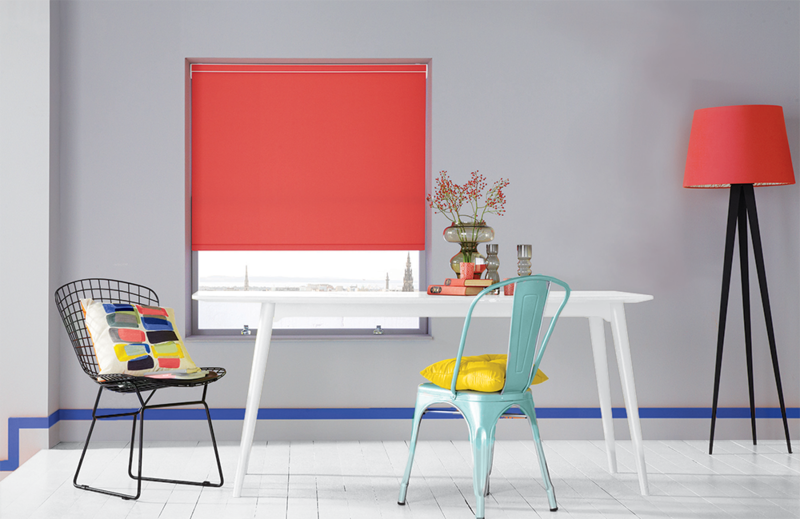 A pop of Living Coral in a few key places is what’s going to bring these colours to life. In the picture above, the single bright Coral cushion with a few minimal accessories and flowers showcases how a focal point can be small but effective and make what could be a very simple room, really pop. Shimmering Sunset – A complementary palette that makes us think of summer holidays, ice cream on the beach and tropical cocktails. These bright tones are warming in spirit but work well in cooler, neutral rooms like the kitchen below and bathrooms. These rooms can often be quite plain and practical but not much fun. When you are trying to keep the kitchen & bathroom clutter from piling up, the last thing you want to do is bring more accessories in to the home. Using these shimmering sunset colours in your window dressings, crockery or even your rubbish bin, allows you to show off your colourful personality in practical everyday items that your kitchen or bathroom actually need. 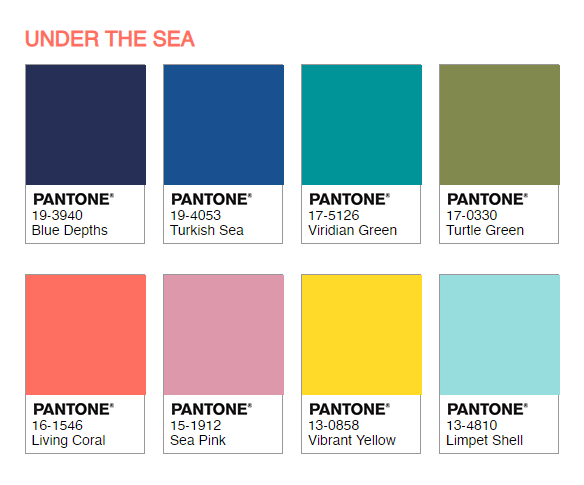 Under the sea- A nod to the real-life inspiration for the Living Coral colour, the Under the Sea colour palette is bright, fun and modern. 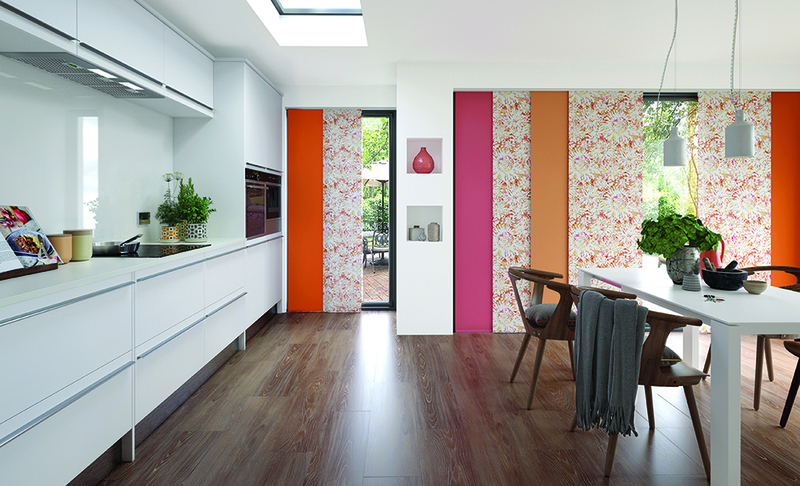 The colours work really well in modern, streamline homes who want to add excitement without too much drama. The simple room below shows you how with very minimal furniture and accessories you can still inject those positive hues into everyday life. We also think this theme would work really well in a playful room for children. If they are a fan of the seaside or marine life, why not encourage them with a room fit for any deep-sea explorer. If you’re looking for more inspiration, you can chat to our design team in house. We’ll do everything to help you create the perfect feel in your home. Not only do we create beautiful bespoke blinds, shutters and curtains, we can also create matching accessories like cushions and seat covers and can reupholster your old furniture. A brand-new look for just a fraction of the price is just a call away. 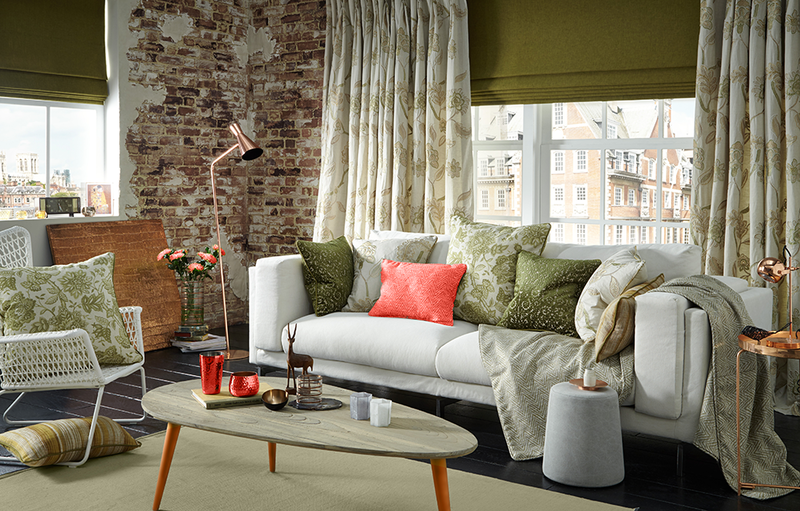 Book your free home visit or come in to the showroom to see our full range.